Nicole by OPI Candid Cameron | Light Your Nails! Super short tonight because I am incredibly tired. Working at an international expo is exhausting to be honest. This gorgeous nail polish is Nicole by OPI Candid Cameron from the Modern Family collection. I know it's an old one but I have no idea if it's still available, sorry. 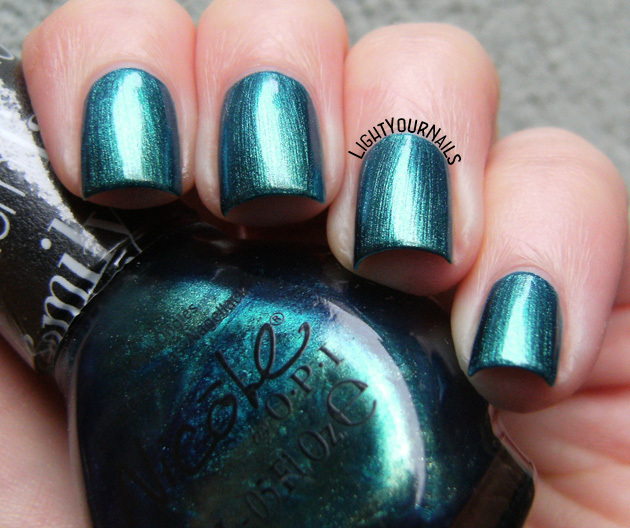 NOPI Candid Cameron is a gorgeous metallic teal colour. Formula is lovely but you can't really avoid brushstrokes. They are very visible which makes me love it a little less than it deserves. I doubled up on base coat and had no staining issues. Stasera sarò breve perchè sono veramente stanca. Lavorare ad una fiera internazionale è sfiancante. Questo bellissimo smalto è Nicole by OPI Candid Cameron, dalla collezione Modern Family. E’ un po’ vecchiotto e sinceramente non ho idea se sia ancora reperibile. NOPI Candid Cameron è un bellissimo blu-verde con finish metallico. La formulazione è ottima però non si riescono ad evitare i segni delle pennellate. Per questo motivo non l’ho amato come avrei voluto. Per evitare di macchiare le unghie ho usato due mani di base ed ha funzionato. I love the Modern Family show and I’ happy to have a couple nail polishes inspired to it. The other one is NOPI Back in my Gloria Days... and it’s my very favourite. I mean, I love both colours but the brushstrokes in Candid Cameron are an issue for me. Do you watch the show? Who’s your favourite character? Adoro la serie tv Modern Family e sono contenta di avere un paio di smalti ispirati ad essa. L’altro è NOPI Back in my Gloria Days... ed è il mio preferito. Cioè, mi piacciono entrambi i colori ma ‘sta cosa dei segni delle pennellate in Candid Cameron mi da abbastanza fastidio. Seguite la serie? Chi è il vostro personaggio preferito? Il colore è davvero stupendo...Per i segni penso che proverei a satinarlo e ciao! I wonder if this one can be used for stamping. Its shade is beautiful. I don't think so but I will try and report! The finish is not for me, but the color is definitely on my taste! I've never seen the show but the polish is pretty - and I know what you mean about working a show, exhausting! So incredibly exhausting! I am glad it's over! I loved Back in my Gloria days so much that I forgot it's sheer haha! Brushstrokey nail polishes shouldn't even exist at this age point! Oh man, that is gorgeous!! It's a little brushstroke-y for my tastes, but I love the color! The brushstrokes are annoying but the color itself is very beautiful! Yes, I know! I feel the same way about it! I love teal, but I am so afraid of them. I know what you mean! I always double up on base coat and remove them super carefully. This looks gorgeous on you. I haven't worn this color in awhile! The brushstrokes would definitely be an issue for me too. It's a shame cause the actual color is so beautiful. HPB Presents: tropical gradient, stamped!